As your garden, lawn and yard grow, a good shed and other storage units become a necessity. You likely have everything from small tools, to a large lawnmower, as well as other items that may need to be stored away for the winter, or even Christmas ornaments that need to be stored for the summer. 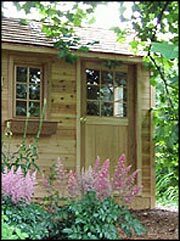 A good garden shed is a great way to free up your garage and to keep everything organized. They can now be easily found in pre-fabricated units or kits. Sheds are made out of wood, resin materials, and metal. It is a good idea to have a layer of concrete laid down before hand if the shed does not have its own floor. This will elevate the floor; keep out water, as well as rodents. There are now fantastic smaller storage units that are made out of newer resins and plastics that are easily assembled or transported and are lighter in weight. They can be used for your shovels, rakes, tools, hoses, and nearly everything else you use in the yard and garden. When deciding on what to use for a storage unit, be sure to calculate the amount of space you need both now and in the future. It is preferable to have extra space than not enough storage space.